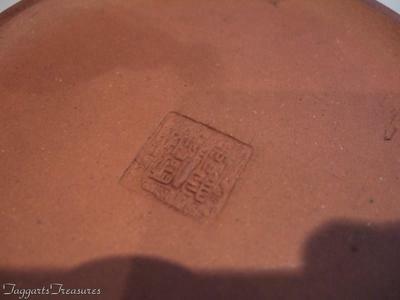 Hi there, I need some help in IDing a Chinese terracotta teapot, it has engraved markings throughout along with an impressed mark to the base and underneath the lid. 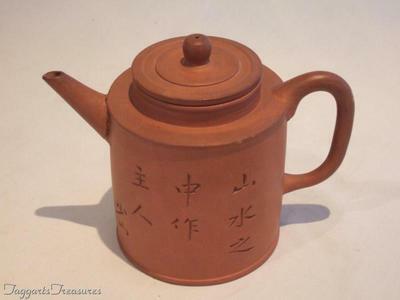 As the title suggests the teapot sold on eBay for over £180 ($300) but the buyer returned it owing to a condition issue. Now that its back in my care I would like know why such interest for a piece that I had quite simply overlooked ! Comments for Yixing ? Teapot - Gathered huge interest on eBay but I now have it back ! Please read these pages and kindly understand that this site is not the right place to ask about this type of ware.